Larry started paddling in Colorado on the Arkansas River, and his passion for kayaking quickly eclipsed his career as a contractor. He traveled extensively throughout Central and South America (leading kayaking trips in both Honduras and Chile) before finding his home away from home–Ecuador. Now he splits his time between the rivers of Ecuador and the mountains of Colorado in the winters and the Grand Canyon during the summers. Even after spending more than two decades in Ecuador, Larry is still amazed at how nice the locals are and how they make kayakers feel so welcome. Advice for people coming to Ecuador? When flying down to Ecuador, carry on your essentials–PFD, helmet, spray skirt, and dry top. That way if the airlines lose your luggage, you’ll still be able to paddle, and that’s what you came here to do, right? 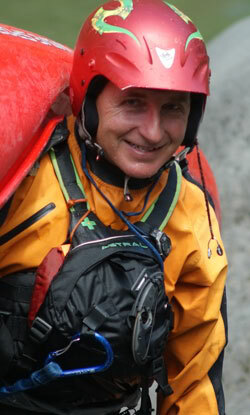 Larry was one of our-boatmen for Moki Mac on a rafting and kayaking trip down the Colorado River. My wife and I were the only non kayakers, these British kayakers had been on rivers all over the world. Larry and the other three boatmen we’re very nice to my wife and I. We were the novices.